Photo credit: Downtown Dallas, Inc.
Dallas is a constantly changing and evolving city. 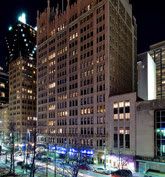 Located in the Arts District, Museum Tower is surrounded by the best the city has to offer. In addition to the exciting new restaurant and retail spaces being added to the Main Street District as a part of The Joule expansion, there are a variety of other new neighbors moving in on the block. Downtown Dallas, Inc. and KRLD "Pulse of the City" special guests got a sneak peek (or taste) from newcomers Freshii, Fluellen Cupcakes (opening in June) and Hospitality Sweet at a recent event hosted at Traffic L.A.
And there are more coming - including Urban Orchard Market, Bar None Café and Urban Vineyard, all occupying the ground floor in the Interurban Building. Capriotti's new location in the Mercantile Building will open soon, as well as Wingbucket in the ground floor at the Metropolitan slated to open later this summer. And there is no shortage of new coffee shops Downtown with the addition of Pearl Cup in the AT&T Performing Arts Center Information and Ticket Office, Weekends in the Joule and Stupid Good Coffee at 1910 Pacific. Article credit: Downtown Dallas, Inc.